how use of experts may serve to confer an element of social legitimacy upon a statutory interpretation. The centrepiece of the analysis is a comparative examination of the use of expert evidence (or lack thereof) in controversial cases in five tribunals: the European Court of Human Rights, the Court of Justice of the European Union, the Supreme Court of the United States, the Supreme Court of Canada, and the Supreme Court of British Columbia, Canada. In great detail the author shows how the three US and Canadian courts have demonstrated a degree of credibility which is very much related to the quality of the expert evidence they consider – credibility he finds lacking in the European judgements. Given the limited ability of procedure to achieve rectitude of decision, this extraordinary work has far-reaching implications for recognition of the rule of law. The author shows how the expert evidence deficiency found in the European courts undermines empirical analysis of their application of the TFEU and ECHR, thus adding another obstacle to an already problematic search for legal truth. Dealing as this book does with the use of vital evidence in the context of a procedural deficit, it cannot be ignored by European jurists or legal academics. Chapter 1 Brief Overview of Statutory Interpretation. 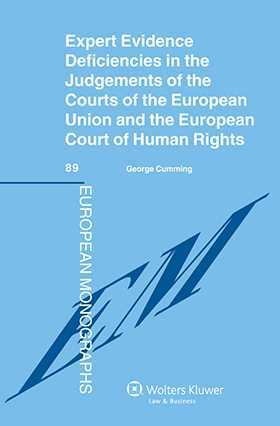 Chapter 2 Scope of Expert Evidence as Regards the Court of Justice of the European Union, the General Court and the European Court of Human Rights. Chapter 3 Use of Expert Evidence in Selected Judgments of the United States’ Supreme Court (USSC), the Supreme Court of Canada (SCC) and the Supreme Court of British Columbia (Canada) (BCSC). Chapter 4 The CJ and GC Involving Primarily Pursuant to Article 267 TFEU References Citizenship and Competition Law and One Direct Action for Non-contractual Liability against the Commission. Chapter 5 European Court of Human Rights Judgments Hirst (2) and Scoppola.